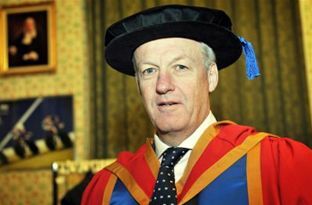 Simon Clegg, former Team GB Chef de Mission and currently Chief Executive at Ipswich Town Football Club, was yesterday awarded an Honorary Doctorate from University Campus Suffolk (UCS). Simon led Team GB to its most successful Olympic Games for 100 years at Beijing in 2008 and the seven year campaign to persuade the government and Mayor of London to mount a bid for the 2012 Olympic Games. Simonâ€™s career included the management of the British Biathlon team and Team GB athletes at 12 Olympic and Olympic Winter games, six of which were as Team GBâ€™s Chef de Mission (overall team manager). He was Chief Executive of the European Youth Olympics in Bath in 1995, the largest multi-sport international youth event ever staged in the UK and was the British Olympic Associationâ€™s first Chief Executive from 1997 to 2008 before being appointed to a similar position at Ipswich Town Football Club in 2009. He was awarded an OBE in 2001 after leading the British team at the Sydney Olympics Games to its most successful performance since the Antwerp Olympic Games in 1920 and subsequently a CBE in 2005 for his contribution to the British Olympic bid. In 2008 he was awarded the British Sports Journalists Associationâ€™s annual JL Manning award for the greatest contribution to British Sport off the field of play.